This impressive conference suite offers seating for up to 32 delegates / up to 50 delegates (Theatre Style) and is ideal for larger meeting, training or presentation purposes. The suite is airy, comfortable and naturally lit with fantastic views of the city and harbour. The suite is equipped with versatile table and seating arrangements. There is also a break-out area, with coffee and tea making facilities, situated within the suite. 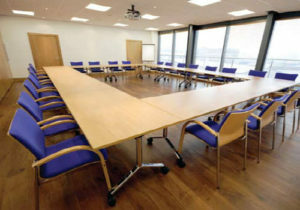 This suite, complete with a unique screened bar, lends itself to additional uses such as charty nights, company presentations or customer events in a completely modern environment.